“How can I trust a God who says He loves us and yet allowed this terrible thing to happen to me and my child?” This is a question many grieving parents have. When everything is going great and I am getting all my prayers answered the way I want, it is easy to believe that God is faithful, and that He is good, and to choose to trust Him with my life. But it is totally different to still believe He is faithful and good and to continue to trust Him when something horrible happens, like the death of my child. If you are like me, for many years I was a “good Christian” and “claimed the promises of God” like praying protection over my family. And I saw Him answer those prayers over and over again. So when my daughter, Becca, died, does that mean God didn’t keep His promises, that He is not faithful and that I can no longer trust Him? This is a huge topic, but for the sake of keeping it short and readable for this blog, I am only going to share five quick thoughts. First let me say that our perspective has everything to do with how this question is answered, which probably shifted drastically at a time when we needed God more than ever in our lives. So in order to shift our perspective again, either a new thought needs to be introduced and received, or an old one reclaimed. I suggest, even if you aren’t on speaking terms with God right now, that you pause to make sure your heart is open to these five things to help you make the needed shift, which will allow Him to carry you through the darkness and back into hope, light and a life worth living again. 1. Some parents are helped by the realization that their child is not missing; he or she is simply absent. To be absent means not to be present for the moment. The Bible says that for someone who has accepted the gift of salvation, to be absent from the body is to be present with the Lord (2 Corinthians 5:8). We may have lost our child from this earth, but it is only a temporary loss. Becca is only absent from my presence for the rest of my time here on earth. I can either focus on my personal loss that my child is permanently absent from this earth (which sends me in a downward spiral) or I can focus on the fact that my child is absent from my presence for now but is present with the Lord in glorious joy and perfection. 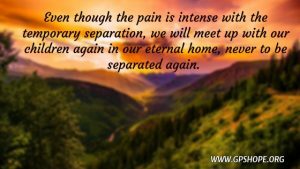 And even though the pain is intense with the temporary separation, I will meet up with my child again in our eternal home, never to be separated again. And if you are tormenting yourself with the thought that he or she might not have made it there, let me say you don’t know that. You don’t have all the information that God does, so choose to believe that your child made the right choice before death and were welcomed in the open arms of the Savior, instead of choosing to fear that God turned His back on him or her. Why wouldn’t God make one last split-second offer? He loves your child even more intensely than you do and paid the ultimate price of allowing His Son to be brutally murdered to pay the price needed for our sins, so that we can all to be together! If that isn’t love, I don’t know what is! 2. Reading the book of Psalms in the Bible can be extremely helpful. Over and over the writer cries out for help from a very dark place of despair. And God responds by being a rock, a refuge and help in times of need. I spend a lot of time there when I “relapse” and find myself struggling with the pain and reality that Becca is gone from this earth and I won’t see her again until I join her in heaven. 3. Don’t try to hide from your fears or pretend they aren’t there. God wants you to bring all your feelings to Him, including the dark and negative ones. You may be wondering, He knows these things already. Why should I have to tell Him how I am feeling? Because you need to admit those things, so you can give them to God and let Him work with you at being set free. If you do this persistently, those tormenting feelings of fear and anger will eventually lose their hold on you, and you will find yourself opening up once again to God’s love and faithfulness to you through the worst trial you have ever faced, and find yourself starting to trust Him again to get you through it somehow. 4. Find different promises you can hold up to God. I have chosen to believe Romans 8:18 more now than I ever did, which tells me the sufferings of this present time cannot be compared with the glory that will be revealed in me. Knowing how great my suffering has been, that must be some incredible glory that will be revealed to me at some point! How about the promise of Jesus telling us He will never leave us or forsake us (Hebrews 13:5)? That is not a promise based on conditions. It is set and firm, no matter what we choose to do or not do or based on how we feel about Him. 5. Remember that God always leads us into triumph. During a worship song at church one day, I suddenly realized that if I bring God into my battle (including the battle of my fears and my darkness) then I will win, because it is impossible for Him to lose! He is the Alpha and Omega, the beginning and the end. God has the first and last word in my life, and He also has it in the life of my child! God has never entered a battle where He came out as the loser, and He never will. 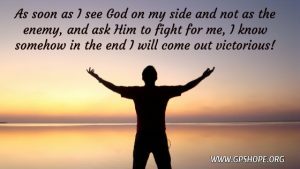 As soon as I see God on my side and not as the enemy, and ask Him to fight for me, I know somehow in the end I will come out victorious! I can offer no easy fix or solution to this often-painful dilemma after the death of one’s child, although it is very black-and-white. We either believe God is good and Satan is evil, or we don’t. We either believe that God isn’t big enough and has not won the final victory over sin and death, or we believe that He is more than enough, and the death of my child is not where God reached His limits. Somehow, He has a way out of the suffocating darkness of grief because of His deep love for me, and I am determined to hold on to Him with everything I have until He gets me to that place. There is freedom in surrender. There is peace in trusting. That may not make any sense, but isn’t that part of what makes Him God? So often life here on this earth won’t make any sense with our limited minds. God sees what we cannot see, and He knows what we do not know. And we need to get to the point where we are okay with the fact that there are just some answers we won’t get on this side of eternity. Living life here on earth without my oldest daughter has been an extremely painful challenge. And in working my way through the grief, I have discovered that God is not who I thought He was. He is way better than how I limited Him before. He is more compassionate, more loving, more faithful, more everything that is good, and that I need, to get me through my remaining time here until I am reunited forever with Becca. 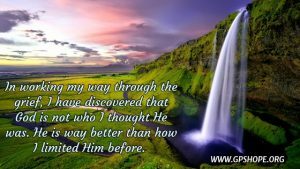 I pray you will make the same discovery. We would love to hear from you. Please share in the comments below which of the five shifts spoke to you the most. You never know who you might encourage with your own thoughts on this subject. 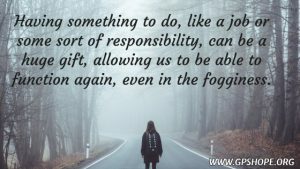 This blog was taken from the book When Tragedy Strikes: Rebuilding Your Life with Hope and Healing After the Death of Your Child. As of the writing of this blog, we are in the process of putting together a free study course for those who want to go deeper than the book takes them. 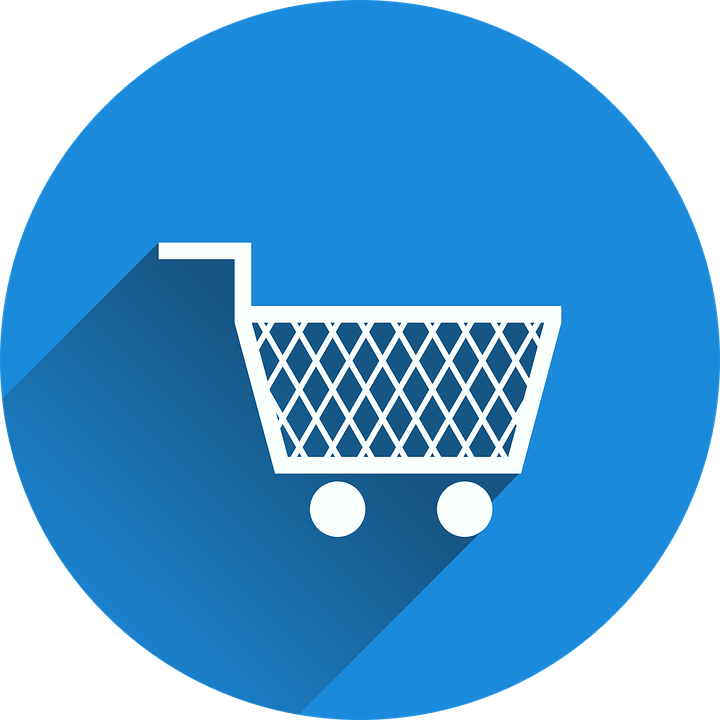 We would be happy to let you know when it is ready to be offered and to send more detailed information. Expressions of Hope is written by author, speaker and singer Laura Diehl. 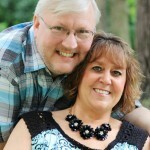 She and her husband, Dave, are the founders of Grieving Parents Sharing Hope (GPS Hope). 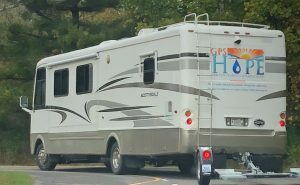 Dave and Laura travel full time in their Hope Mobile (a 38-foot motor home) to be more easily available for speaking and ministry requests, including being invited to hold one-day GPS Hope & Healing conferences. Laura is a national keynote speaker and has also been a workshop speaker for events such as The Compassionate Friends and Bereaved Parents USA national conferences, along with being a guest on radio shows, podcasts and other media channels such as webinars with Open to Hope. If you would like more information about Laura as a speaker for your next event or want more information on hosting a GPS Hope & Healing conference, click here. 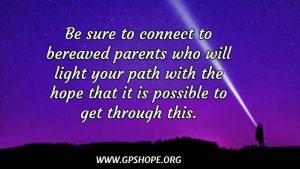 GPS Hope exists to walk with grieving parents through the suffocating darkness of child-loss, guiding them to a place of hope, light and purpose. Subscribe to Laura’s YouTube channel. She shared a situation where two of them had an impression in their spirits that he was there at a profound event at a certain place for a few seconds, very happy with what was happening. Plus, there was another time this mom sensed her son’s presence in a very real and almost tangible way. These are not “flaky” people. They are very rooted and grounded in their relationship with the Lord, and spiritual leaders and pillars in the Body of Christ. They are sensitive to the voice and presence of the Holy Spirit. I have a question; do you ever feel like your daughter’s spirit is around you? I always feel like she is around me. Sometimes I get confused, like I wonder did she ever cross over or does she just come back to visit? J.A. It really is such a good question, and one that I find interesting to answer. Since it comes up so often, I finally decided to share my thoughts on this subject in a blog. First, let me say that God makes it very clear we are NOT to go to mediums or try to call up the dead (Deuteronomy 18:9-11). That is dangerous and opens the door for the demonic realm to approach and deceive us, letting darkness have an influence in our lives disguised as light and hope. But that is not what I am talking about here. I know strong Christians who are positive they occasionally feel the presence of the spirit of their loved one who died and no longer has a bodily form. These Christians have not sought after them as a spiritual being. They are not going to psychics or mediums to try and hear from their loved ones. But at some point, usually quite unexpectedly, they suddenly just “know” that their child or loved one is in the room with them, usually very close by. 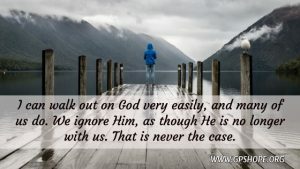 When I started hearing these stories, I realized it was not my job to judge, but to be like Mary, and quietly ponder those things in my heart, taking them to God. And in doing this for several years now, I have only recently allowed myself to begin to explore outside of what I was taught, that when a person dies, they leave this earth and we are totally separated until we ourselves die. Period. That’s it. End of story. I didn’t allow myself to even remotely consider anything else because I have been afraid of “being led astray” and seeing something because I want to see it, allowing myself to be deceived. 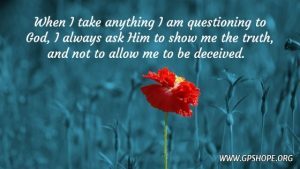 But when I take anything I am questioning to God, I always ask Him to show me the truth, and not to allow me to be deceived. So, I have to believe that He will honor that, and the Holy Spirit will help me sort it out without going down the wrong path on the questions I put before Him, including this one. So, let me take a deep breath and say that I have begun to believe that it is possible that our children’s spirits have opportunities to visit us, for the specific purpose of bringing comfort, peace, or whatever our need is for that moment. And there are places in the Bible that support this. First, we know there are spiritual beings, angels and demons, all around us. 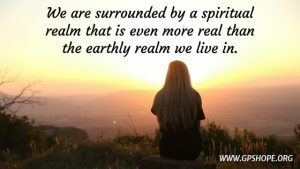 We are surrounded by a spiritual realm that is even more real than the earthly realm we live in. Remember when God opened Jacob’s eyes to see a ladder to heaven with angels ascending and descending (Genesis 28)? So, if our children are no longer contained by their bodies, isn’t it possible that God occasionally allows them to ascend and descend as spiritual beings also, if there is a purpose for it? Then there is the time when Moses and Elijah came to earth to speak with Jesus before His death (Matthew 17). And how about the “great cloud of witnesses” that Hebrews chapter twelve talks about, referring to the entire previous chapter of those who had died? Is it just those in Hebrews 11 who are in that group, or is it everyone who has died and now has full access to the Father as a spiritual being without bodily limitations? We are three-part beings. We have a soul (our mind, will and emotions), we live in a body, but we are a spirit being. Jesus was very clear that He was leaving this earth so that the Holy Spirit could come (John 16:7). He lives inside us when we believe and receive by faith that Jesus died for our sins and was resurrected. We are the temple of the Holy Spirit (1 Corinthians 6:19), so our spirit is fully connected with the spiritual realm, whether we are aware of it or not. In John chapter ten, Jesus says His sheep hear and know His voice and follow Him. As Christians, we are supposed to be sensitive to the Holy Spirit, growing in knowing His voice, so we can grow in our direct communion and fellowship with Him. It is a Spirit-to-spirit connection. So, if we are aware of God’s presence, is it that far off-base to occasionally be aware of the presence of our child’s spirit, who is connected to Him, Spirit-to-spirit as well? 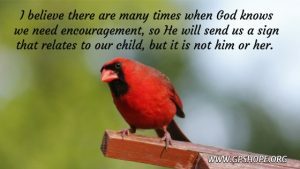 Let me also say that I believe there are many times when God knows we need encouragement, so He will send us a sign that relates to our child, but it is not him or her. For example, let’s say a grieving parent is floundering hopelessly in the suffocating darkness of their grief. A cardinal comes and sits within 3 feet of them. Knowing their child loved and collected cardinals, some parents will think their child came to visit them as that cardinal. There is no scriptural ground that anyone’s spirit comes back in the form of an animal. However, I do believe that God, in His deep love and compassion, sent that cardinal to give peace and comfort, because of the special connection their child had with cardinals. 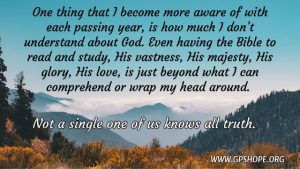 One thing that I become more aware of with each passing year, is how much I don’t understand about God. Even having the Bible to read and study, His vastness, His majesty, His glory, His love, is just beyond what I can comprehend or wrap my head around. Paul tells us in I Corinthians 13:12 that we see in part and we know in part. We cannot see the full picture, because what we see here on this earth is like looking through a dark glass. Yes, I know we have the Word to teach and guide us, but there is not one single person here on earth who doesn’t have blind spots and wrong beliefs in some areas. Not a single one of us knows all truth. But we are constantly being taught by the Holy Spirit, who lives inside us, having our eyes opened to more light and more truth, which continues to set us free from false beliefs. Have I had a sense that Becca’s spirit is around at some point? No, but I have had twice when I fully believe I was in heaven with her. God gave me a vision, allowing my spirit to join her before His throne and in the heavenly city. So, in answer to the question, “Can the spirits of our children come to us?” I will say that I have started to believe it is possible that our children’s spirit can come and be with us at times on assignment for a specific purpose. I would love to hear from you on this subject. If you do not agree, please share in a loving and respectful way. Anything harsh and judgmental will not be approved to be posted. As I started reading books and joining Facebook groups after my daughter Becca’s death, I kept hearing from other grieving parents how having something to do, like a job or some sort of responsibility, was a huge gift. It allowed them to be able to function again. I’m not talking about “busy work” to avoid the pain of processing what happened, but doing something that caused at least one shattered piece of their life to feel normal again. They might have been in a fog, they might not remember any of it, but at least it kept them from sitting around with nothing but their thoughts taking them deeper and deeper into depression. The man who was my pastor at the time put me in a place of “rest” and isolation, believing I was having a spiritual melt-down, since I was having such an emotional struggle after Becca died. It went on for weeks and then months. I don’t even remember how long my husband had off from work, but at some point, he went back. About a week after the funeral, my youngest son went back to school. The rest of the kids also got back to their previous life schedules. Were they all in a fog? No doubt about it. But even going through the motions of life helped them. I didn’t have that. I would spend hours and hours in my little prayer room under the basement stairs, mostly sleeping and crying. I would read my Bible, pray for a while, cry, and then sleep some more. That became my life because I had nothing to go back to, since the pastor would not allow me to have any kind of ministry or leadership role in the church, totally misunderstanding the grief I was working through. I have no problem following spiritual counsel from leaders God has place in my life. But something is very wrong when a spiritual leader becomes the voice of the Holy Spirit in a person’s life, and when that leader tries to override a woman’s Godly husband. But during this time of intense grief, I allowed both of those things to happen, and it nearly destroyed me. My husband, Dave, kept asking me, “When is this time of ‘rest’ supposed to be over?” All I could tell him was that I didn’t know. Although Dave wholeheartedly welcomed a season of rest for me after Becca’s passing—even sending me on a cruise to relax and enjoy myself—when the weeks turned into months and he saw me spiraling even further into despair, he became very concerned. He saw how wrong it was for me to be kept in this prolonged place of “rest”, knowing I needed to return to the things God had called and anointed me to do in ministry, which would allow the Holy Spirit to flow through me to others as part of my healing. There actually was one area I still functioned in. The international ministry I was a part of had a correspondence school, and I was the administrator of that school. I have no idea how I did it, but somehow, I limped my way through overseeing the students. But there were things that definitely fell through the cracks, and students did not have much of my attention beyond just grading their work. My leader was full of grace and did not pull me from my job, allowing me to work in a state of barely functioning. I honestly don’t believe I would even be alive today if I did not have that job and those students as a thin connection to my previous world beyond my isolated grief. I am sharing this with you because I don’t want you to do to yourself what was done to me. God can still minister through you and use your circumstance while you are broken and working through your grief. In fact, I believe that in a rather short amount of time you occasionally need to allow yourself to be a vessel God can flow through. When we have nothing in ourselves to give, God seems to flow in a very strong way through us. We are completely out of His way and we find 2 Corinthians 12:10 being fulfilled in our lives: when we are weak, He is strong through us. Feeling His strength flow through our weakness and our brokenness stirs life and brings some of that deep healing we need in our souls. I can 100 percent guarantee you’re not going to feel like participating at first. You might even cry while you’re doing it (whatever “it” is). That’s okay. 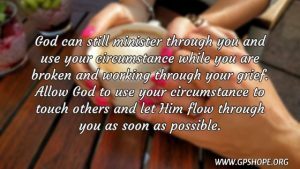 The important thing is to allow God to use your circumstance to touch others and let Him flow through you as soon as possible. Don’t wait until you feel strong. God is so gracious, so faithful, so deeply in love with you and full of compassion for you. He knows exactly what will bring a healing touch to your innermost being. So, when an opportunity comes your way, whether it is public like being on a worship team, or private such as someone asking you to connect with a friend of theirs who just lost a child, I encourage you to make yourself push through and do that one thing. Then push through and do the next thing that comes your way. Have someone compassionate and caring pray for you, to give you the strength and whatever else you need to follow through. Remember, when we are weak He is strong. 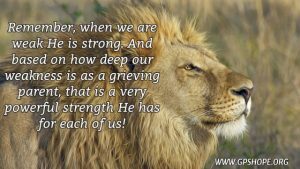 And based on how deep our weakness is as a grieving parent, that is a very powerful strength He has for each of us! As grieving parents, we are in survival mode for weeks and even months. With life’s demands, we often put what little energy we have into those around us and have absolutely nothing left for ourselves. If you would like a list of simple ideas that you can do to help care for yourself, we would be happy to send it to you. 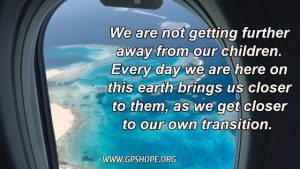 Note: Your information stays with us, and you will start receiving a Weekly Word of Hope from Grieving Parents Sharing Hope (GPS Hope) which you can opt out from at any time. • If you are a bereaved parent, we encourage you to connect with us on Facebook. 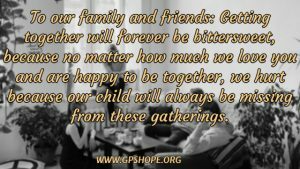 • If you are not a bereaved parent but want to support those who are, or want to follow us as we give hope to these precious parents, please connect with us at Friends of GPS Hope on Facebook. • Subscribe to Laura’s YouTube channel. When our child passes through this life ahead of us, the pain is more than can be put into words. But as life around us goes on, we eventually (and I use that word very loosely) learn how to function with that piece of our heart missing. But every event that should be worth celebrating, is now bittersweet. Getting together for the holidays will forever be bittersweet. Yes, we can be grateful and enjoy those who are gathered there. and even have moments of fun and laughter when we are all together, but whether we say it or not, in our hearts there is an undercurrent of pain, knowing we aren’t really all together. For instance, as we watch the next generation of cousins enjoying each other, we are blatantly reminded that our child is not there with them. No matter how much we love our family and are happy to be together, we hurt because our child will always be missing. Bittersweet. Graduations, school dances, Mother’s Day and Father’s Day, birthday parties, weddings, baby showers…all of these and many more celebration events and milestones can be overshadowed with a reminder of who is not there and be bittersweet. Our middle son will be the only one of the siblings who had all five of them present at his wedding. The other four will be missing their sister, both at the event, and in the family wedding photos. Bittersweet. Almost one year to the day of Becca’s death, we had the blessing of a new little granddaughter coming into this world. She was given the name of Becca as a second middle name. Very bittersweet. And since then we’ve had three more grandchildren born into our family. Every day a grandchild makes his or her entrance into the world is miraculously wonderful, but we can’t help but also feel the deep sting that someone important is missing, as Becca is not there as a newly proud aunt. Bittersweet. 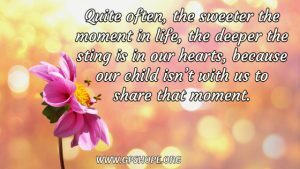 What I have found is that the sweeter the moment in life, the opposite is also true; the deeper the sting is in our hearts because our child isn’t with us to share that moment. Is there anything we can do to ease that sting? When those grief waves come, I will be one of the first ones to tell you it is important to lean into it, allowing yourself to feel the pain, like a valve allowing the pressure of grief to be released. And the fresher the loss, the more painful pressure there is that needs to go somewhere. In fact, it may be one constant release for weeks and months. But we all come to a point somewhere down this road, where we get to make a choice. Am I going to keep that painful loss in the forefront of my life, leaning into the bitterness of my earthly loss, or am I going to find ways to lean into the sweetness of life that is still all around me? If you are ready to move further away from the bitter, here are three suggestions to help lean into the sweet, during those bittersweet events. When I feel the heaviness of grief trying to come in, I will pause and think of my beautiful Becca in heaven, dancing on two legs, with Jesus. She is in the greatest celebration of all (which means she is not really missing out on much here compared to what she is experiencing). I will remind myself that this earth is not my permanent home. “For the things which are seen are temporary, but the things which are not seen are eternal” (2 Corinthians 4:18). I tell myself that at some point, life on this earth won’t matter, and we will all be united for eternity. What a glorious day that will be! Focusing on my child’s gain, and the fact that this world is not permanent, allows me to lean away from the bitter and into the sweetness of the moment. It helps when the family makes sure the memory of our child is kept alive at these events. Since I have written about this before, I won’t go into it here. One is Three Ways To Help a Bereaved Parent During the Holidays and another is Five Suggestions for Bereaved Parents Who Have Been Told, “You Should Be Over This By Now” (specifically point number 4). Connect with other pareavors (bereaved parents) who can let you know that all of those crazy thoughts and emotions you have (that make you think you are a horrible person) are NORMAL for a parent who has lost a child. Below are some actual quotes from grieving parents that you might be able to relate to. It has been three years, and when I hear of the ones around me talking about doing or seeing things with their family, it still just sends me into a roller coaster. The hardest days I’ve lived with in the past almost five years (besides the initial shock and despair) following my daughter’s murder? When her younger siblings caught up to, and then passed her in age. Does anyone else find it hard to be happy for someone who is expecting when your heart is permanently broken?? When people ask how I am doing I just say fine, because the very few times I’ve broken down and told the truth they didn’t want to hear it!! So unless it’s a really bad day and I can’t hold the tears back, I just lie and say I’m fine!! I have lost 3 children to death too soon. I realized the more I wished for the day to be over, and praying the next day would be better, that I am letting my days slip away. We are not promised tomorrow so I must learn how to live … It’s our personal choice as life stops for no one. …it has been 9 yrs since my oldest son passed in a wreck, and today I laugh again. You will laugh again, you will smile again, you will feel joy again… it’s a very black journey for most of us, but we do get thru it. It’s different for everyone, we all react differently to things, but this is one thing the most of us moms agree on, we could not have gotten thru it without each other’s help and shoulders to cry on; the wisdom of the mothers who had gone thru it before us. …She has been gone now for longer than she lived. My life has not stood still; my grief did not hold its shape like concrete. It is a process through which we move, and we return to joy of a different kind, laced with gratitude for what we’ve had and what we still have… Choose to heal, and you will. Intend it! Then follow the path, step by step, until you’re there. When we do choose to move toward a measure of healing, desiring to bring laughter and joy into our lives once again, it is hard work. It is a battle. It can be exhausting. Choosing to focus on the blessings we have, and leaning into the sweet, instead of the bitter, can be extremely difficult. But it can be done, and it is so very worth it! 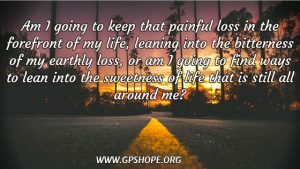 Here at Grieving Parents Sharing Hope (GPS Hope) we pray that you choose life, and to connect with us to walk with you on that journey. 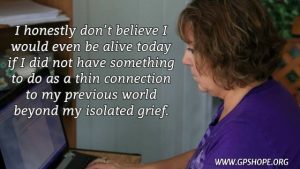 The quotes in this blog were taken from Come Grieve Through My Eyes: How to Give Comfort and Support to Bereaved Parents by Taking a Glimpse into Our Hidden World. Many bereaved parents have endorsed this book, saying how much it helped them to understand their own grief. We would like to directly offer this book to our readers for half price! It is your choice for the eBook only $3, or a signed paperback copy only $5 (plus S/H). This is limited to one per person, but you can let your friends and family know about it, to get their own copy. For the eBook (pdf version for only $3) click here. REMINDER: This is NOT Permanent! Death was not God’s idea when He created the world. God only gives life. 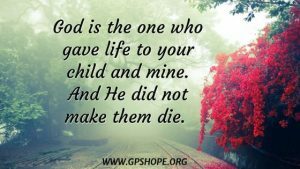 God is the one who gave life to your child and mine. And He did not make them die. Even though God did not create death, He knew it would be part of life, and made sure that He still had the final say, because when we die, it is not a final goodbye. 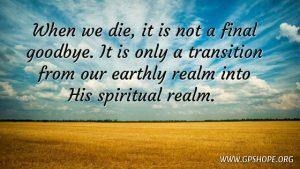 It is only a transition from our earthly realm into His spiritual realm. I know; death feels so final. When my daughter, Becca, died, I was thrown into such a horrific place of darkness. I knew where she was, and I publicly proclaimed it boldly at her funeral. But that didn’t keep me from the darkness and fog that took over my life for many, many months, even stretching into at least two years. One thing that helped me, that I wish I had grasped sooner, is that this is only a temporary separation. I knew that in my head, but for some reason my heart had a much harder time accepting that as a truth I could hold onto, to pull me out of my darkness. All I could see is that she isn’t with me now, and how unfair and painful that was to me, to her dad, her siblings and grandparents. All I could think about was what she would miss, and what we would miss not having her here with us. In fact, looking back on it, I was almost consumed with the thoughts of what I had lost from this earth, to the point of almost having panic attacks when thinking about being here for one year, five years, ten years without Becca. There were times I could barely breathe from the pain of it. But God in His graciousness stepped in over and over again, as I laid my pain at His feet, groaning and sobbing to Him for help. One of the things the Holy Spirit spoke to me was that I am not getting further away from Becca. Every day I am here on this earth brings me closer to her, as I get closer to my own transition. That made a huge difference in how I was able to start seeing things through His eyes of love instead of my own eyes of loss. That verse is now life to me like never before. Those of us who know the pain and suffering of grieving the death of our child, a pain that is beyond any words, have something to look forward to for sure! If the glory to come is so fantastic that it cannot even be compared to the depth of our suffering, then I say bring it on! Another translation says, “This is how I work it out. The sufferings we go through in the present time are not worth putting in the scale alongside the glory that is going to be unveiled for us.” (NTE) I love how it says we have to work it out, because that is exactly what has to happen. And that whole thing about how the glory we will experience will far outweigh our greatest pain and suffering here on this earth… I don’t know about you, but to me, it is pretty mind-boggling to think our children are already experiencing it and know what that glory is like. But in the meantime, we are left with holding onto Him as He carries us through the darkness, allowing Him to breathe life back into us. It may seem impossible, as most of us on this road ahead of you believed as well, but you really can have a life of hope and light, and even a life with purpose and meaning again. It looks different, but it’s kind of like learning to live with an amputation. A part of our very being has been cut off from us, and it takes a long time to heal and learn how to live with that piece of us missing. But allowing the truth to seep deep in our hearts that this is only temporary, and what is to come is so much better that this will all be forgotten, will help tremendously. The VOICE translation says we “focus on the things we cannot see, which live on and on.” That is exciting to me; to think that our children are already in the place where nothing harmful or hurtful can ever touch them again, including our own death. Have you ever thought about that? We have taken the pain for them. They will never have to experience the pain and grief of our death when it is our turn to transfer into the heavenly realm! I know as a parent, I am always thankful when I can carry a burden so that my children don’t have to carry it. And this is the ultimate burden we can carry for them. They will never have to go through the painful grief of our death. I love how the Message Bible says it. 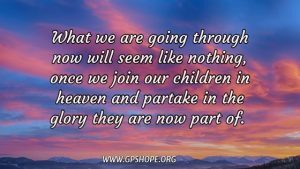 What we are going through now will seem like nothing, once we join our children in heaven and partake in the glory they are now part of. Jesus said in Matthew 6:21 that your heart will always be where your treasure is. We have an extremely valuable treasure in heaven, so it makes sense that our heart will be there until we can see and touch that treasure once again. We are ALL eternal beings. Our children are not gone forever. We are just separated temporarily. They are living on and on in a place we will eventually be also. Praise God, He made a way that our separation is only temporary. We have put together a list of Thirty-Six Scriptures of Hope that can be printed out to read and meditate on. If you would like to have this sent directly to you, just let us know below.